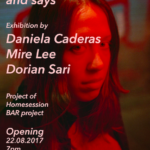 It is a lover who speaks and says, a collaborative project of Homesession and Bar project, is an exhibition of three resident artists from different background. Each of them presents works that carry handmade quality in their own particular way. Daniela Caderas takes a direct visual reference from the road tiles in Barcelona, transforms it into her visual language using embroidery. 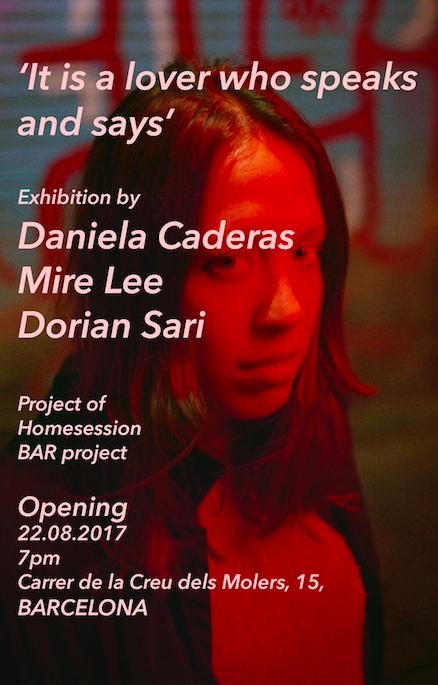 Mire Lee presents a short story and a figurative sculpture through the portrait of a girl whom the artist met here in Barcelona. Dorian Sari displays a large-scale fabric, a found object in the Bar project’s flat, on which he created dense and obsessive traces with two different textures. As an amalgam, the exhibition creates a scene where different energies meet each other and speaks directly but also affectively to the audience. Daniela Caderas (Switzerland, 1983) uses a wide variety of everyday materials in her sculptures and installations. Her diverse practice draws on the legacies of craft techniques such as embroidering, sewing and forging. By testing and playing with contemporary visuals that are based on western culture Daniela opens up a critical dialogue between art, fashion, lifestyle and materialism. Mire Lee (Korea, 1988) explores the inner motives that exist in the properties and materials of sculpture. Employing diverse media other than sculpture, her recent practice studies the shape of energy such as drive, vitality, charm and sentimentality. Dorian Sari (Turkey, 1989) Multi-disciplinary visual artist. Observer of politics, motions and social movements. Looking into human beings, cultures and projects them with personal mythology in his installations. Making sublimation of actuality with materials found in the street. Mire Lee (Korea, 1988) is a resident artist in Homeseesion from July to August 2017. Undergraduated in Sculpture/Media Art in 2013 at Seoul National University, she employs diverse media to explore the drive and energy as well as the blunt characteristics proper to three-dimensional media. She had a solo show The War Isn’t Won by Soldiers It’s Won by Sentiment in Insa Art Space in 2014 and participated in projects such as A Snowflake (Kukje Gallery, Seoul, 2017), Do it 2017 Seoul (Ilmin Museum, Seoul, 2017), The art of not landing (Cake Gallery, Seoul, 2016), Mediacity Seoul Neriri Kiruru Harara (SeMA, Seoul, 2016) among many. 1-Your work presented at Homesession connected the exhibition space on the first floor with the residence space on the second floor, in which normally the visitant can’t not access. You are the second artist in Homesession who uses the residence space as a stage for her work. Talk us a little more about this decision. I had a vague idea about producing a short story and possibly a sculpture coming along with that. When I came across Alba (the central figure later in the final piece), I instantly wanted to enhance the intimacy of the initial proposal. I find it interesting that the bed, the most intimate place of all, is so closely placed above the working place-that is the gallery, the studio. 2- Do you think there is a link between your piece and the rest of pieces from the exhibition? Not necessarily. As most of non-curated group shows, our show did not intensely seek the connection between the presented works. Although it was a pleasant coincidence that all of us shared strong hand-made quality in the way we work, that helped us to navigate. 3- In the work that you present to us, we find a text in which you talk about your personal experience related to another person that you met here in Barcelona. This intimate issue is recurrent in your work. Why this interest? This question is something that triggers me also. Thus in my head, it is still in the progressive form. I work a lot with materiality, which is the primordial quality for me when it comes to producing an art piece. I enjoy touching material and playing with its texture and property. For the moment, I think intimacy plays a double role which on one side allows me to freely engage with the material in the way I did so far, on the other side makes the link between this act and the topic or subject that I get to fixate in the world outside of the language of material. 4- Could you contextualize the piece you present to us into your work? Does it link with any older project? Do you have plans of developing it in the future? I did a piece called abusable sculptures in sleep in 2016, where I put the sculptures I made in the bed. I personally relate Alba to that piece a lot. I’ll be interesting to develop “bed” or a “sleeping state” as a fictional place where more artworks can sit on. As for Alba, I discarded the arm and only brought her hands with me, so I am planning to make its new body for the moment. 5- What would you comment about your stay in Homesession? The staff and curator were wonderful people and the overall structure is very free and open. I think this is the driving force for the space to have been able to build such long history and a lot of events. The stay itself gave me a sense of claustrophobia a little bit, which I think helped when in the case of Alba. 6- How would you value your collaboration with the Bar Project artists? For me, it was mostly communication with artists. Since we soon became friends, collaboration part was really painless and comfortable. Also, the curators from the Bar Project were very supportive.